LOS ANGELES -- The Los Angeles' Clippers' hot streak of five games came to a screeching halt on Tuesday night at the Staples Center as C.J. McCollum caught fire early and often to lead the Portland Trail Blazers to a convincing 125-104 victory. McCollum sank six triples to finish with 35 points. 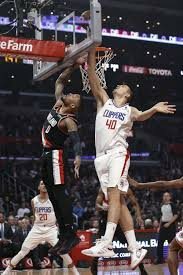 Compounding the Clippers woes was the stellar play of Damian Lillard and Jusuf Nurkic, who combined for 40 points, 15 rebounds and 13 assists. Enes Kanter, who recently joined the Blazers after leaving the New York Knicks, contributed 14 points and nine rebounds. Portland improved to 41-26 to keep their place at fifth in the Western Conference while the Clippers stayed in seventh place at 39-30. Montrez Harrell and Lou Williams came off the bench and tallied 22 and 18 points respectively. Shai Gilgeous-Alexander added 15 but the Clips couldn't get going, making only 38 of their 95 shots overall (40 percent) despite a high mark of 9-for-15 from long distance. In contrast, the Trail Blazers went just 12 of 31 from three land but they hit 47 of 96 overall, a high 49 percent rate.